I’ve been going to Dreamforce, salesforce.com’s big annual shindig for many years, and for many years, I’ve seen the same thing over and over. And no, that’s not what a party! Which it is. It’s not oh, whoa, another big, big event. Which it is. It’s not, another amazing work of presentation art. Which it is. It’s a ruthless consistency of vision. A vision that I have repeatedly told a story about and been amazed at why others can’t just see what is obvious. So, to get across the point, once again I am going to start this with a story that I’ve used before. There is a poetic sensibility to the statement, not in a beautiful turn of phrase or its elevating language, but in the essential nature of the statement. In one sentence he defines how companies in the 21st century should be thinking if they aren’t already doing so – with a richness of implication that can define a decades long approach that can work in dramatically changing circumstances, roiling times, or quiescent periods. In other words…always. This statement, whether Marc Benioff and his crew are conscious of it or not, is a paradigm for how salesforce.com actually works. Here are the details. As the cliché sort of goes, forgive me if you’ve heard this one already. Back in 2003, I was writing the 3rd edition of CRM at the Speed of Light (its 4th edition has been out since 2010). I was on a trip to Shanghai when I found out, that, by coincidence, Tien Tzuo, currently CEO of Zuora, then chief marketing officer/chief strategy officer of salesforce.com and a friend was also in town. We met for breakfast at some hotel – which one escapes me at this point – I’m getting old – and we had this discussion, which was recorded in the 3rd edition and it goes like this. CRM is an entry point. What we (salesforce.com) are planning to be is the business web. That means that we want to be the platform for all business apps. When a business starts its business day, they open up their apps on us and all day, all their apps are running on our foundation. This is what I got from the conversation. Here, on the other hand is a quote that I’m repeating from my post in 2011 that comes from the Third Edition of CRM at the Speed of Light, written way back in the days before there was an Internet of Customers (more on this later) or Things or Pings or whatever this is that we have now. Even though he says “Yahoo”, which believe it or not, was a powerful entity once, this is still the same vision that salesforce.com has now and has had forever, even with their brief forays into the territory of ugly e.g. social enterprise etc. Salesforce.com has NEVER wavered from this vision for even a second. The system upon which…has become the platform. That platform, until Salesforce1, had been Force.com, and then Force.com and Heroku and then Force.com and Heroku and Exact Target’s Fuel (for a very short time as a “standalone”) and the various tools that helped grow the platform – e.g. Apex. Now that vision, always stubbornly adhered to, with often wild aberrations on the details is moving toward completion. But that doesn’t mean full bore execution, nor does it mean that it’s a huge revenue producer. It means completion – which I will explain in a little while. This part is just the starter, the appetizer. We are on an Italian meal plan for this post and the salesforce platform as a service (PaaS) effort – this is just the antipasto, with the primi, segundi, and dessert to come. Though don’t hold me to the analogy. It might be stretching it a bit too far. Forgive me in advance. However, before we get into the platform “thing” and a sundry other matter or two of importance, I’m going to do something that I always do which is take a look at the conference. Only now, as I did with Oracle Open World and JiveWorld, I’m going to take a look at the conference with a report card that grades each of the vendors on their conference effort. Please realize the conference report card is a work in progress and at this stage is not comparative. By the beginning of next year, I should have it down and a comparative report card will be issued as the conferences occur and made available to whoever wants them on my whenever its ready to be announced website and via email. So, first, let’s look at the conference itself. With age, we often repeat the stories that we tell. So I’m going to claim age and repeat a discussion. The conferences that software companies have once, and even occasionally twice (Microsoft comes to mind here for their business apps and partner conferences annually), per year, are critical barometers of a company’s success. It may not seem that way but ultimately, the world is watching things like attendance, announcements, and to some extent extravagance. They are looking to see financial health, technology advances, messages to the market and how exciting the environment around the conference is, what customers are saying and what analysts and journalists are saying – and trying to read what management means when they say something. The thing is that these conferences also set the tone for the entire following year until the next one. The level of excitement, the quality of the effort, the depth of the offerings and the revelation of information all are scrutinized with a microscope. Investors, customers and analysts make decisions – all based on what they hear, see and feel at the conferences or if they can’t attend, what they read about the conferences, if they haven’t followed it virtually. It’s why so much is made of Dreamforce, which has become the industry standard for a conference well done and a “dream” conference – do it the way that salesforce does is the mantra of most other companies. It’s also why salesforce invests so much in making this the event of the year for attendees one way or the other, with the mix of internal messages and demos, external keynotes of non-technology interest, a high energy “tone” to the event and a usually well and highly orchestrated set of interactions between executives and others both publicly and privately. Salesforce, preferring to scale every year, does a magnificent job normally. But with scale comes an increased likelihood of either problems or at least signals that can change perception. With 135,000 registrants and god-knows-how-many in attendance live, there were both of those this year. The signals were good, the problems were…well…problems. Don’t get me wrong. As an analyst attendee whose travel was paid for, I was more than grateful for what the always superb salesforce analyst relations team did for me and others. They paid attention to our needs (I hesitate to call an analyst/journalist really nice lounge with food that is separate from a work area a “need” but it was great to have – and conducive to work.) and that is always something I am thankful for. The team led by the wonderful Carolina Grimm and overseen by my longtime friend and star SVP at salesforce, John Taschek and his sidekick, who I also consider a great friend, Steve Gilmor, is among the best in the biz. I say that without reservation. Just to take a moment. I’m inserting an aside. In case you are wondering if those friendships ever, ever prejudice my work with salesforce. Nope. Not one iota. I can have friends working somewhere and still be dispassionate about the companies they work for. Reality is I don’t even like business so why in the world would I care about hurting the “feelings” of a company? I care about them being successful because I want this industry to be successful and these companies play a critical role in that industry. If I feel my criticisms are better served publicly they are made public and if I feel they are better served privately, they stay private. But those criticisms have no impact on how I a. feel about my friends; and b. admire those who are doing good work even if their company isn’t. Nor does it bother me to praise a company if they deserve it. I’m neither a fanboy nor a hater of ANY company. To me the success of the industry, which entails the success of all the companies in it, is important. Not because it provides me with a living – though it certainly does that – but because it provides a service that benefits businesses, which is a good thing – something I’m sure you can see, if you aren’t an emotionally blind individual. I’m just saying this so you can be clear on how I do what I do. I’m already clear on it. Back to our main programming. We start with the report card – grades and comments. Keynotes B The keynotes, all in all were fascinating and, smart. As always, salesforce makes interesting choices with their external speakers – this year, Wayne Dyer and Deepak Chopra. This is one of their hallmarks. They are smart enough to realize that a. people hunger for more than just product pitches and tech talk and b. it does their brand serious good to be associated with things outside their immediate sphere. So they nailed that part again – and again – and again. However, this year, the messaging was off a bit and it impacted the entire conference – though not to the extent that it hurt a lot. I’m covering some of this in the general text here but the key particular is that far too many people came out of Marc Benioff’s keynote speech thinking salesforce1 was about a mobile platform – not about an all-encompassing platform. There was too much of a story around mobile –which admittedly is an area that salesforce hasn’t done historically well in – and too little around PaaS in context of outcomes. More in the text as I said. Sessions in general A- There was very little that wasn’t covered in the 1500+ sessions. Analyst relations & press A- Salesforce always does a great job here. Their team is top flight, their preparation excellent. They have to deal with a large group of analysts (I think about 260 this year or something like that) and that is a daunting task given our egos. But they are smart – providing a centralized area for press and analysts to do work and to talk and meet, a nice environment and a way of getting schedules for presentations etc. The only downside, though an understandable one, given the sheer scope they deal with, was the lack of one- on-one meetings, typically an important part of a conference for an analyst or a journalist. Food quality (mass) N/A Can’t speak to this one. Ate out most of the time. Food quality (analyst relations & press) B+ This was interesting. Very good quality, meals were available as was mead – okay, water, juice and soda – continually. Even a wine tasting done by a salesforce customer to enliven the proceedings. Well done. Exhibition Hall B I’m not sure how many partners were exhibiting but, like Oracle, it took two halls to accommodate them. They did a fine job, with clear signage so you could find the exhibitors you were looking for and with almost enough room to walk without slamming into other bodies. Almost. Not as well laid out as SAP’s Sapphire but this one was better than most others. Crowd energy A As always, tremendous and electric, but a bit more muted than in the past – probably due to the sheer size of the audience. But, one thing that can be said about salesforce crowds when they gather is that they are fanboys/girls. They are committed salesforce acolytes and good for salesforce for creating the conditions that created those committed customers, employees and fans all around. Overall ambiance A- As always, nearly brilliant. DJs playing music that was just loud and heart pumping enough without going overboard, really well laid out environment in the hallways, given the size of the crowd. Lots of open space, great outdoor viewing areas. The only minor glitch was the scope of the conference was SO large that it forced some of the traffic to all the other hotels in the area and they were all mobbed. Attendee support A+ Brilliant again, among others, hiring the homeless (according to sources) and training them to handle questions that attendees had no matter where in downtown San Francisco they were walking. The level of knowledge of the mobile service reps was exceptional in many cases, good in most. They handled heavy rains for days really well additionally, which simply highlights how well prepared they were. For example in the analyst kit, there was an umbrella (salesforce logo emblazoned) in anticipation of the weather. They do this so right. Paradigmatic. Virtual Conference (NEW CATEGORY) B The conference keynotes were easily available, the technical side was decent with some minor glitches, and the site nicely designed, but the lack of updates and links in an easily consumable fashion was a bit of a problem. They were there but you ultimately had to work hard to get them to do what you wanted. OVERALL GRADE A- They did it again, and this time at an unprecedented scale. Bravo for pulling this one off. It ain’t easy. And we have to appreciate that. At this scale to do what they did was amazing. They impressed my wife who was attending the keynotes – and she isn’t a technology person. She loved the environment and already pre-registered for next year’s free keynotes. That tells you a lot about the dynamics of this. So yay, SFDC! This is a welcome, but not a new message. For example, for many years I’ve been saying it in a slightly more succinct way – “at the end of every B is a C” when I’m asked to address the differences in approach from B2B to B2C. The same principle governs what I’m saying as what Marc said at Dreamforce 2013. Ultimately, you are dealing with an individual human being who purchases and consumes things; could be products; could be services. But it is done by a human being who has a purpose, drive, direction in life and things that they want out of it on their journey to be happy with their life. The world as it is now is more deeply tied together than it ever has been because of the communications revolution of the last decade plus and thus how we help others to achieve this via communication and information has markedly changed. A company like salesforce.com, at least the theory goes, can support this by providing the technology that enables the journey, at least from the business side of it, though that is increasingly intertwined with the personal too. The “Internet of Customers” is a succinct way of saying this, with a play on the “Internet of Things” as part of that. Another and similar idea though expressed differently for the last year has been the SugarCRM mantra and messaging around “CRM for everyone”. The premise is the same, though with significant variance on the emphasis. SugarCRM’s thinking is that while there are millions of users of CRM, CRM is for everyone, not just the users that we normally think of – especially due to the changing conditions in the world. We are dealing with individuals whose expectations of what we provide are that it will help them do what they more effectively. The difference between salesforce’s approach and SugarCRM’s is that SugarCRM is probably a little more employee focused – meaning what they provide helps the individual employee deal with the individual customer (though I’m not truly doing justice to SugarCRM’s vision here) Salesforce is more focused on the interconnected customer – meaning what is provided deals with the customer who is on multiple devices at any given time doing their business or consumer thing. Salesforce’s “Internet of Customers” was the starting point for all the discussions at Dreamforce 2013 and I suspect many months down the road’s discussions too. In fact, it is a great theme that can carry them for quite a while. It was omnipresent at the conference, so much so, that, given that salesforce was planning on announcing something huge at the event, here was my take on it. But the Internet of Customers is a key theme for their platform evolution. One that is mission critical – and far better as a consistent theme as anything they’ve done for several years (though what they’ve done hasn’t been so bad). It is a clear evolution of last year’s “customer company” and yet, falls in line with their vision of the last decade. This year, if you listened to the tone of the conference, you would get a quiet buzz rather than the raucous, loud, super-electric hyper-intensity of the past Dreamforces. And that’s a good thing. Because what salesforce announced as the core message of Marc Benioff’s and subsequent keynotes was that their platform vision has matured, evolved and arrived – and it was actually present in the room. That means that not only have they brought salesforce1 into existence as a concept, but, unlike other “the future is the present” keynotes, they’ve done the stitching necessary to intermesh force.com, heroku1 and Exact Target Fuel so that they have a matured (not fully mature) PaaS offering that stands as perhaps the strongest on the market. The thinking behind this as an evolutionary stage in their vision is that we now have an Internet of Customers. There are billions of customers who are using interconnected devices and services in all facets of their lives. Salesforce1 is supposed to be the backbone for all these devices and services. To do that, salesforce created a single open platform from its multiple platform pieces (see above). It is both tied together and made extensible by a rather vast library of APIs that have been created to make this what they hope becomes a dominant vehicle as per their vision of over 10 years ago. Technologically the platform is in the here and now and it is sound. They’ve done an excellent job of creating the singular infrastructure and designing the revamped architecture they needed to pull this off. That said, that doesn’t mean it’s complete. But it is well on its way to completion. Star analyst/influencer Esteban Kolsky of ThinkJar estimates that its 75 percent — 80 percent which should make it ready to service 85 percent — 90 percent of salesforce’s existing customers. The only actual glitch isn’t technical; it’s on the marketing side. They were a bit off message at Dreamforce. If I didn’t know better, I would have thought that salesforce either made breakthroughs in mobile technology or have developed a mobile platform, rather than an all-encompassing platform that works on all devices, mobile or static. What’s funny is that they now have a platform that creates a concrete salesforce.com ecosystem for all salesforce applications and those that others care to build but, of all things, they under-market it. That is something I never EVER thought I would say about salesforce – that they under-market ANYTHING. But, folks, there it is. Salesforce1 solves the problem of lack of mobile specialists and lagging innovation with a revolutionary approach to app development for the social and mobile-first world. It delivers breakthrough productivity for all users by putting the customer— employees, partners, consumers, and devices— at the center of everything, and making every employee a mobile developer. The result is an insanely fast, hyper-connected mobile solution with the potential to be as disruptive as Software as a Service. It’s time to build the future today! The Salesforce1 Platform gives organizations the freedom to innovate. Designed for scale, it provides open APIs for extensibility and integration as well as powerful developer tools; there’s no limit to what developers can build. The Salesforce1 Platform’s flexible development models enable every administrator or developer to create custom apps with a unique, yet familiar, mobile user experience and powered by mobile back-end services. Well, as far as I’m concerned, and I repeat it again, it’s much more than a mobile platform, even though to read and listen to them, you might not think so. Personally I find it to be an exciting and smart evolution of the salesforce platform – and an important one. In an exchange with Esteban Kolsky, Marc Benioff, Dennis Howlett and others on Twitter, it was clearly seen the same way by Esteban and Marc but Marc insisted that they did the messaging correctly, while Esteban said it was seen by many as a mobile app. I would concur with Esteban here. I spoke to a lot of attendees about Salesforce1. The attendees, whether they were analysts, partners or buyers, tended to think it was a mobile…something. Look at the visuals presented and you can see why. Don’t get me wrong. I think this is the best and most important evolution of salesforce in years, because it moves their vision that much closer to reality. Plus, unlike other times when what Marc spoke of as the technology of the present was still about 6 months away (and was delivered), this time they have what they are talking about – it is a PaaS that is here and now during the here and now. But, unfortunately, their message is misshapen (and I chose “misshapen” carefully – rather than “wrong”). They need to be unequivocal and crystal clear about the power of what they are providing if they are to make the impact in the marketplace they want to make. Platforms as such don’t sell themselves. What you can do with the platform and in what formats you can do it do sell the platform. Outcomes are the thing – and the focus. How does using salesforce1 make what you are trying to do in your business easier and better and even more interesting and enjoyable to do? Does it provide you with the tools you need (as part of the Internet of Customers) to get the outcome you desire – not just your company, but you and your company? This isn’t the message that the keynotes provided but, even with the misshapen message – as I said, not entirely wrong, but inadequate – what salesforce1 is – and it is here and now – not six months from now – is explosive without a bombshell. And that’s a great thing for salesforce and the achievement of their very stubbornly held vision. Now we move onto the next area of interest. The ever popular and always dished on Marketing Cloud. For the past several years, since salesforce claimed a marketing cloud with the acquisition of Radian6 and Buddy Media, I’ve been on their case about providing the basic functionality that marketers need. This year, they acquired ExactTarget, which, truthfully, made me happy, no matter what premium they might have paid for the property. Because, now, salesforce could legitimately claim that they had a real marketing cloud. In fact, when I had the benefit of a deeper dive into Exact Target during an advisory day at salesforce earlier this year, I saw that they got a lot more than just what I thought was an email marketing application/service on steroids. They had a customer interaction engine, which was equivalent to (though not as good as) Epiphany and of course, as we knew already, they got Pardot. For those of you who don’t know Pardot, it was, until it was acquired by ExactTarget in 2012, they were among the leaders in marketing automation, especially for mid-market sized companies. They were one of the few who had a complete marketing automation solution that spanned all the requirements that a midsized company had – and they had a good product and smart leadership in addition. When salesforce acquired ExactTarget, many of us saw Pardot as either the plum or the hidden gem (I couldn’t figure out how to talk about a secret fruit here) in the portfolio. Salesforce engineers could scale it and it could provide all the capabilities that marketers need – especially the single most important one – campaign management – which is the one common capability that any marketer in any channel or field needs routinely. Sad to say, salesforce missed this one. For reasons that are I think either technological or off message, they moved Pardot to the Sales Cloud and focused it around demand generation – i.e. lead scoring et al. I don’t know if that’s because they aren’t exploiting Pardot’s technology to its fullest potential or the messaging was off enough to mask its value. To my knowledge and I checked with multiple friends and attendees, there was no mention in any keynote of campaign management as an offering – which is a centerpiece for a marketing cloud. I’m hoping this was merely off message and that salesforce recognizes what they have in Pardot and exploits its capabilities. I also think that salesforce needs to hone its message around the Marketing Cloud by making sure that campaign management gets referenced since it is the one technology that all marketers of all stripes and hues need. I’m not saying that lightly. The competition for the Marketing Cloud is heating up big time now with the rebranding of Oracle Eloqua and the rebranding of Adobe Neolane. All called the Marketing Cloud. Plus, I’m seeing the redoubling of efforts by companies like Marketo to take a piece of the market – and all the niche players out there who will nip at the heels of all the big boys. This is a no joke market with a lot of room for growth and a lot of upside for participation in it. But the applications have to be excellent and the presentation pristine. Salesforce isn’t quite there yet. They are making progress big time on the applications but the messaging still isn’t where it has to be. Oh yeah, one other thing. Lose the “Exact Target” in the “Exact Target Marketing Cloud” name. First, salesforce owns Exact Target now. Second, it’s a useless extra name with zero value whatsoever. Adobe Campaign is what Neolane was and its part of Adobe’s Marketing Cloud. Oracle’s Marketing Cloud is Oracle Marketing Cloud. As far as I can tell, salesforce paid $2.5 billion for Exact Target. So it is salesforce’s Marketing Cloud, not Exact Target unless Exact Target now owns Radian6 and BuddyMedia too. If there is one thing that salesforce does better than most it is that they are a company that has a heart and it’s a heart driven by Marc Benioff’s genuinely charitable soul. The Salesforce Foundation, in combination with Marc’s personally generous giving has been core to the mission of the company for many years, both in the sheer dollars that move to various great causes to the philosophy of 1/1/1 that drives the entire company. That philosophy and model, which says that each and every employee gets 6 days paid time to work at something charitable and important; that the company will donate technology to worthy causes e.g. free enterprise licenses; and the final 1 is grants to deserving causes. According to Marc B., over 2000 companies have adopted this model to date. They wisely led with this for the event, which set a good tone for everything and at the same time, hopefully set the tone for action from other companies. I mention this because I never want it to put to the side while we all analyze the things that companies do in their day to day business. Social philanthropy and the commitment to it tell you a lot about what the culture of a company is like. AND, sometimes, it’s just nice to see a person and or a company doing some good for someone or something else. This conference was a harbinger of excellent things – if salesforce reshapes their product messaging. They have made a significant evolutionary leap toward their rock solid vision in a way that reflects their maturity and eliminates what little yahoo they had left in their thinking. They are a company that everyone has to not just contend with but fear a little as a true market leader. However, they have to be sharper in their presentation –words I never thought I’d utter when it comes to salesforce.com. 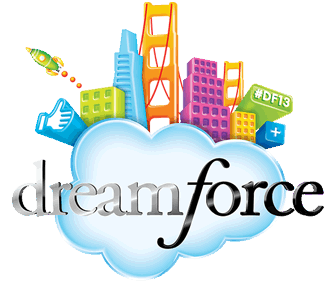 Their message as it comes out of the Dreamforce 2013 yaw is not the message that the market needs to hear. Too much on the interconnectedness of things and people around social and mobile – which, while certainly cool enough, doesn’t drive business standing alone. Omnichannel, as bad a word as it might be – and it’s horrible from a literary standpoint – is the word of the day because all those customers that salesforce rightfully IDs in their vivid Internet of Customers story, need to do work – and get results – and do it in whatever channel they need to do it in. Social, mobile, but phone, desktop, meeting, virtual meeting, text, email ad infinitum. It’s our nature to work the way that we want to work and when we can’t, we don’t do as well as when we can. Thus, salesforce, which is publicly stating that it can be the platform for that work, regardless of how you want to do it and what outcome you want from it, needs to make sure that they can convince the market of that – something they are a little short of now – in their own presentation. They actually seem to have the tools to pull it off. Now, they have to convince me and the millions of customer that all consumers and business folk are. Let ‘er rip, SFDC. You have the stage. And the platform.